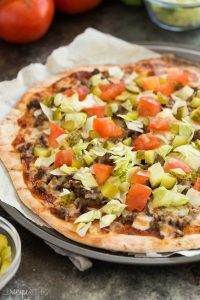 Grilled Cheeseburger Pizza Recipe -- perfect for summer! 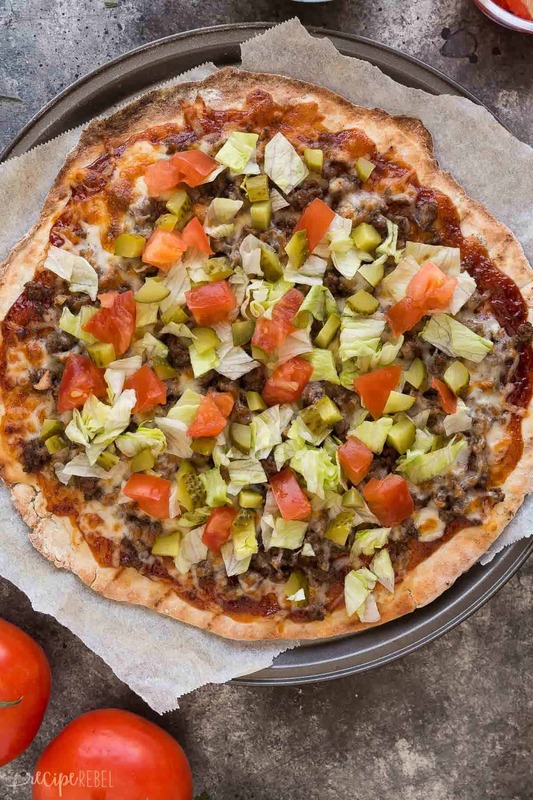 This Grilled Cheeseburger Pizza is an easy summer meal idea! The pizza dough comes together in just 10 minutes and cooks in 6 minutes on the grill! A quick dinner recipe for any night of the week, loaded with all your favourite cheeseburger toppings. The first time I grilled pizza, you guys… my mind was blown! I couldn’t believe how quickly a pizza crust cooks on the grill — just a few minutes on each side — and it takes on the best flavour! Grilled pizza has definitely become one of our summer staples, and this cheeseburger version is going to be on repeat from now until the leaves start falling (and hey, maybe even after that, because isn’t that what covered decks are for?? 😉 ). The best part of this Grilled Cheeseburger Pizza? This Sweet Vidalia Onion Barbecue Sauce from Sweet Baby Ray’s. It has the best mild, sweet onion flavour, and goes perfectly with our cheeseburger theme here. 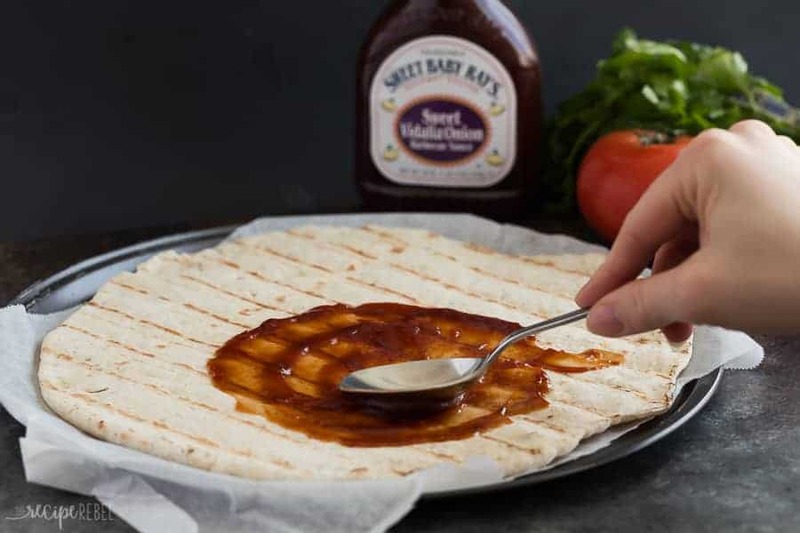 If you want to mix things up, try any other Sweet Baby Ray’s Barbecue Sauce — Honey Barbecue, Sweet and Spicy, Honey Chipotle or Kickin’ Bourbon would be a fantastic twist to this pizza! Finish it off with your favourite burger toppings: diced tomatoes, shredded lettuce, dill pickles, whatever you’re into! Feeling even more adventurous? Try a drizzle of mayo over top after cooking. The important thing to keep in mind with this Grilled Cheeseburger Pizza is how quickly the cooking process moves. You really want to have everything prepped and ready before you throw that pizza dough on the grill, because it cooks quickly and you won’t have a lot of extra time! Thankfully, this recipe is really easy to prep ahead. I like to have my pizza dough prepped and waiting on the counter or in the fridge, my ground beef mixture cooked and ready in the fridge (or make extra and store in the freezer! ), my cheese shredded, my toppings prepped, and a large cutting board or baking sheet ready to move the pizza onto after cooking (plus something to move it with). Grilled pizza is incredible — burnt pizza not so much! Follow the tips in the post above to prep ahead, and if you’re always in need of super quick meals on weeknights, prep extra to keep in the freezer! You can make a freezer meal kit with pizza dough, cooked ground beef, and shredded cheese, and then just take out and assemble as you need it. Make sure your grill is really clean and hot when you add your pizza dough to prevent any sticking. You can use this same pizza dough recipe and cooking method to make a variety of pizzas with a variety of Sweet Baby Ray’s sauces: try ham and pineapple or barbecue chicken pizza with Hawaiian Barbecue Sauce, or use up leftover grilled steak on a pizza with some Honey Teriyaki or Sweet and Spicy Barbecue Sauce — there are so many flavour combinations to choose from! 2 cups shredded mozzarella cheese or use your favourite! In a large bowl, stir together 1 cup all-purpose flour, yeast, sugar, oregano, garlic and salt. Add water and oil and stir until combined. Add just enough flour (roughly ½ cup, but a little more or less is fine) until the dough comes together and is no longer sticky (add it gradually – you don’t want to overdo it!). On a lightly floured surface, roll the dough out into a 12” circle (or as thick or thin as you like it). Place on a cutting board or large plate and set aside. Preheat the grill on medium-high heat, to about 350-400 degrees F.
In a medium skillet, cook ground beef, onion, salt and pepper on medium-high heat until browned, about 5 minutes. Bring all toppings to the grill with the pizza crust. Carefully place pizza crust on the preheated grill (be sure it is clean so the crust doesn’t stick). Close and let cook for 2-3 minutes, just until bottom is dry and starting to turn golden brown. Keep an eye on it – it cooks quickly! Flip the pizza crust, drizzle on barbecue sauce, and add the cooked ground beef and shredded cheese. Close and let cook another 2 minutes or just until golden brown. If your cheese has not yet melted when your crust is cooked, turn the grill off, move your pizza to a cooler part of the grill, cover, and let melt. Not grilling season? You can easily make this in the oven! Just roll out your pizza dough on a pan, top, and bake for about 13-16 minutes at 425 degrees F, until golden brown. Thanks Sarah! It’s a new favorite! A great family meal that we all love. Grilling the pizza makes the crust so yummy! Thanks Sam! I love how quickly it cooks on the grill! I adore grilled pizza and the whole family will inhale this version! It looks fabulous!